Make sure your next outdoor adventure is successful by preparing a tent camping checklist. A sure way to put a damper on your trip is forgetting an essential item, such as a sleeping bag! A list will help you avoid such an occurrence. After you have your categories written down, brainstorm and write down a detailed list in each area. Write down even the most obvious items. Writing down everything you might possibly need, will help you remember everything, even during the hustle and bustle of packing the car. In the food category plan what to bring based on your menu and how many people are camping. Following are some suggestions of what you might need to bring on a campout. If you need help downloading the printable checklist, check out these helpful tips. The week before your trip, have your camping checklist out on the counter or your desk. Add additional items to the list as you think of them. Take the list with you when you go shopping if there are items you need to buy before the trip. Use the list to gather the items you need. To make packing the vehicle easier, spend the week gathering the items on the list and stacking them together in the garage near the vehicle you will be taking or somewhere out of the way in the house. Pack most of your vehicle the day before you leave on your trip, other items may have to be packed the day of the trip. Most of the items on the list have been gathered up in the pile near the vehicle you are taking on the trip. Start to pack the vehicle using the list; only check the items off the list after they are packed in the car. 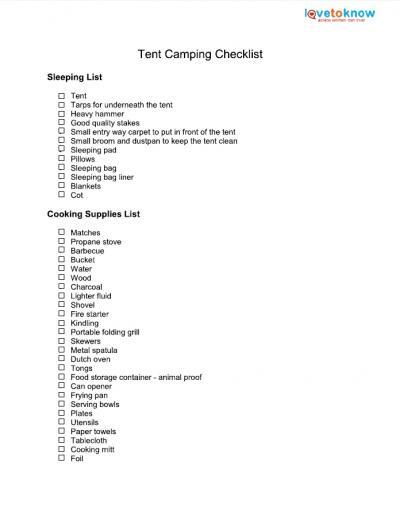 The above tent camping checklist may have more or less items on it than you need. Think about what you will need for your camping trip and make a personalized list. You will be surprised how much more organized you will be on your camping trip when you pack using a checklist.